Designer wallpaper brand Thibaut has a selection of colourful and bold patterns from modern collections Bridgehampton, Damask, Faux, Graphic Resource, Greenwood, Natural Resource, Summer House, Texture and many more. The Bridgehampton Midland T24314 wallpaper is a large-scale graphic pattern that has a leaf-like mot.. The Damask Resource 4 Alicia print in T89125 in Raspberry is the boldest of the Alicia print colourw.. The Graphic Resource Taza T35171 in Navy is a sleek and stylish small-scale geometric print that fea.. The Greenwood Diamond Head luxury wallpaper is a beautiful geometric diamond pattern that is repeate.. The Bridgehampton Basketry T24351 wallpaper in aqua blue is a beautiful, tranquil coloured designer .. The Bridgehampton Tanglewood T24374 wallpaper in green is a spring green wallpaper design with a bea.. The Dedalo T35153 wallpaper design has been named after the Italian word for ‘maze.’ The symmetrical..
One of the metallic shades of the nine colourways, the Thibaut Damask Ashley T89170 Wallpaper in pea.. Dark, glamorous yet incredibly tactile the Taluk Sisal T75156 in Blue is a muted blue/ grey shade. T.. Perfect for adding a sense of tranquillity, the Cabrera T35136 Blue by Thibaut would suit any interi..
American luxury wallpaper brand Thibaut has designed a bright and colourful array of on-trend design.. The Graphic Resource Pierson is a large-scale two-colour interlocking trellis pattern. The slight ac.. This tile effect print would suit any interior space and colour scheme with over six colourways to c.. This crisp, geometric square star motif is sharp and square in style, however, the designers behind .. The Brittany Stripe T85049 is a neutral beige and white design making this soft design a perfect col.. The Bridgehampton Portofino T24301 in blue and aqua is a fun and calm floral design that features nu.. The Taluk Sisal Red wallcovering by Thibaut is a beautifully rich and vibrant red colourway that wil.. The Surfrider T13108 in Light Grey is a light grey shade with the grass cloth material presenting sm.. Looking for a traditional coloured kilim wallpaper design to add pattern and colour to your interior.. The Summer House Sunburst T13092 wallpaper is the simplest of the Sunburst colourways with its neutr.. The Taza in Metallic Silver on Grey is perfect for matching with any colour scheme whether your tast.. The Passaro Damask T89141 print has a textural appearance with the aqua blue background consisting o.. This beautiful bold, two-tone floral print features a warm and vibrant Pink painted flower and leave..
Thibaut enlivens the classical Damask trend with colour and innovative print treatments such as prin.. The Summerhouse Cayo T13160 wallpaper in Coral is a simple rain drop effect wallpaper design featuri..
Thibaut are a renowned American luxury wallpaper brand who strive to create new and innovative wallp.. The Greenwood collection encompasses traditionally rooted patterns for the here and now. This collec..
Thibaut specialises in timeless designer wallpaper designs that are inspired by traditional wallpape.. The La Farge T35203 wallpaper design in Metallic Pewter on Taupe is a warm yet dark and muted wallpa.. The Summer House Cyrus Cane T13143 wallpaper in Turquoise is a cool blue yet attractive wallpaper de.. This smooth snakeskin styled wallpaper design is available in numerous colourways all consisting of .. The Surfrider T13111 in Cream is a warm cream shade with the grass cloth material presenting small l.. The Greenwood Kimberly by leading American wallpaper designers Thibaut was adapted from an antique d.. The Curtis Damask by Thibaut has been carried over from Damask Resource 3 in its best-selling c.. 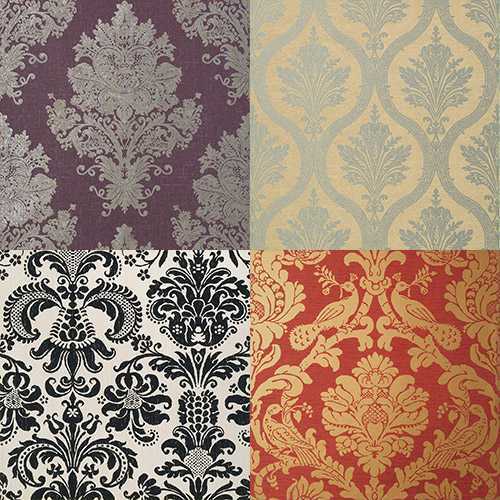 Similar to the other damask prints in the Damask Resource 4 Collection, the Passaro Damask T89137 fe.. The Thibaut Summer House Sandy Point T13151 wallpaper in Navy consists of a warm off-white, block co.. Looking for a dark and sultry textured designer wallpaper for your home or commercial design space? .. The Widenor Chevron Wallpaper T35190 design features in Thibaut’s Graphic Resource Collection; a col.. The Taza Wallpaper features in Thibaut’s Graphic Resource and is a small scale, a repeated pattern t.. The Summer House Summer Stripe T13135 Wallpaper is perfect if you are looking for a subtle yet class..
Add soft vibrancy to your walls with the Cabrera T35137 Green by Thibaut that will suit any interior.. If you are seeking a whimsical and story like wallpaper design, the Bridgehampton Peacock Garden T24.. Looking for a dark green designer wallpaper for your home or commercial space? One of the bolder col.. Featured in the new Graphic Resource Collection by prestigious American luxury wallpaper brand, Thib..
Thibaut is an esteemed American brand renowned for their traditional and transitional wallpaper consisting of a wide offering of wallcoverings with styles ranging from historic reproductions, traditional and classic patterns, tropical and novelty patterns. Thibaut is specifically known for their signature colour palette, bold graphic designs, coordinating print fabrics and unique textured wallcoverings resulting in depth and dimension that cannot be achieved with paint. Established in New York 1886, the brand still bears the founders name, Richard E. Thibaut, an American of Parisian descent. Thibaut is the oldest continuously operating wallpaper company in the United States, delivering unsurpassed quality and versatile designs serving a vast network of homes, interior designers and showrooms worldwide whilst remaining true to its history and legacy. Thibaut was ahead of its time with the pioneering floral designs found in their first printed fabrics in the 1960’s. Thibaut murals gained immense popularity in America introducing statement walls consisting of bold colours, prints and patterns to the everyday home. Thibaut have had an impressive list of clients with their wall coverings being displayed in the White house during the year of 1993 and two of the brand’s murals were featured in the six Academy Award Winning film ‘Forest Gump.’ More recently the brand has introduced a dedicated line of upholstery weight woven fabrics as well as acquiring luxury wallpaper, fabrics and embroideries brand ‘Anna French.’ Despite Thibaut transitioning from a wallpaper editor and distributor to an upscale design house the brand continues to operate as a close-knit family orientated company. Today Thibaut have an impressive archive of over 10 collections and over 700 individual consisting of unique textures, prints, colours and materials that are created using a variety of methods to create unique and exclusive designs. Patterns may originate from an antique document, personal sketch, or commissioned artwork. The designs are heavily influenced by travel, industry events, art and nature found in the designer’s everyday lives making the product offering relatable to the client. The key to the brand’s success is that vision and collaboration goes into every product that Thibaut release. This vast variation of wallcovering is what separates Thibaut from its competitors as the brand are fashion-forward and easy for anyone to love and have in their homes whether they are visually or texturally alluring. We are proud to stock the innovative tactile range of wallpaper by Thibaut here at Naken Interiors which are utterly tactile and designed with beauty and strength in mind. 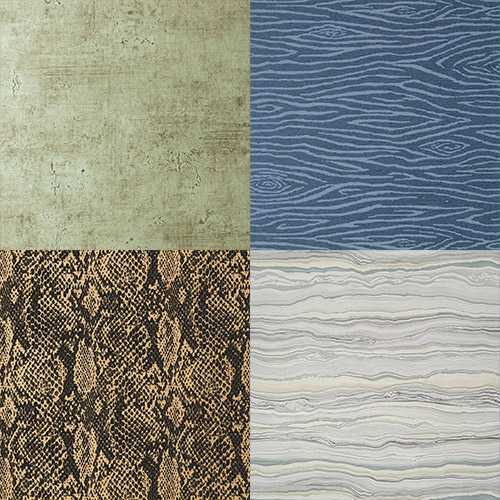 The Thibaut tactile collection is tremendously hard wearing with stain resistant, cleanable and easy to apply qualities. The tactile range are extremely unique and practical for the everyday home with realistic patterns ranging from a bark effect to a snake skin effect perfect for high traffic areas such as bathrooms, hallways etc.